Get the exact Roof kit you need. What makes Flexitec 2020 a system of choice? 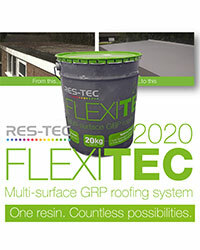 The First Flexible GRP Roofing System with Full Overlay Capabilities Similar to GRP fibreglass, Flexitec 2020 is genuinely rapid-curing (30 – 60mins walk-over time) with an extra-tough finish. Similar to liquid overlay systems it’s flexible and can coat a range of roof surfaces. Can be applied to almost any roof surfaces including felt, asphalt, concrete, GRP, PVC single-ply and metal details. Single resin system that can be repaired/overcoated without grinding down. Applied as one coat (10-year repair system) or two coat (20-year roofing system) system. Highly flexible and suitable for any size or shape roof without the need for expansion joints. Extremely rapid installation with walk-on times of 30-60 minutes. Uses 225g/m2 fibreglass CSM for an extra tough membrane that lasts decades. Installations by trained installers of the two-coat system are supported by Res-Tec’s trusted 20-year materials guarantee. Anti-slip finish available for balconies and walkways - Cold applied for maximum safety – no risks from open flames and other hot works. Suitable for application in temperatures as low as 5°C or as high as 30°C. Totally seamless membrane – no joints, no welds, no weak points. Manufactured to ISO 9001 and ISO 14001 standards for consistent quality.